Welcome to Microbial Art, a collection of unique artworks created using living bacteria, fungi, and protists. We are pleased to present this site as an example of the exciting interface between art and science. We also consider this an excellent opportunity to showcase the beauty of organisms that usually go unseen and therefore are often feared (sometimes rightly so) or ignored. We invite you to browse the image galleries and to find out more about the creators of these works — both human and microbial. 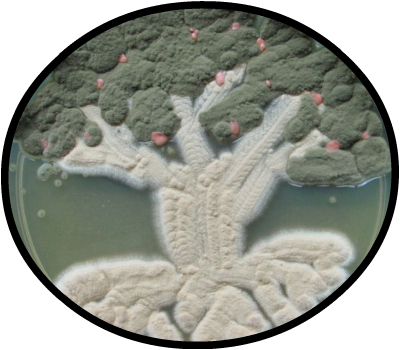 Microbial Art presents a collection of art by scientists and artists from around the world, and using a wide variety of taxa and techniques. If you make use of any of the art featured here, please be sure to give appropriate credit to the artist. Please obtain permission before reproducing any art in a published format. The website was created by Dr. T. Ryan Gregory, University of Guelph, Canada, Oct. 2009. It is maintained and updated by Dr. T. Ryan Gregory (Canada), Dr. Simon Park (United Kingdom), and Dr. Niall Hamilton (New Zealand). Be sure to visit Dr. Park’s blog Exploring The Invisible for many fascinating examples of microbial art.